TVs these days are not just an appliance for you to watch videos on. There are Smart TVs which you can hook up to the internet and use it for browsing. Or you can use your TVs as an extended monitor for your laptop that having a keyboard just for the TV can be quite handy. 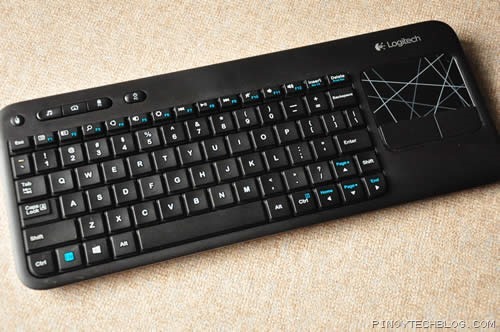 The Logitech K400r wireless keyboard is a compact keyboard with a touchpad in place of a number pad that’s made for people who use their TV other than for viewing in the comfort of their couch. The keyboard is light and you can feel the plastic material used as you handle it. The back has a nice white color which looks good as long as you keep it clean. Opening the battery hatch will reveal space for 2AA batteries and small compartment for the tiny Unifying receiver should you wish to bring this keyboard somewhere else. On top is a lone power switch although it will go to sleep when not in use. Unfortunately, there are no LED indicators to let you know when there’s still power left on the battery. 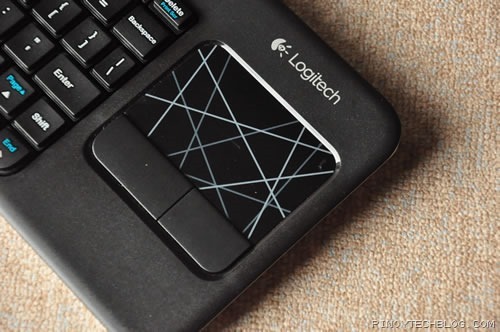 Logitech claims that a pair of batteries will last this keyboard up to 12 months. 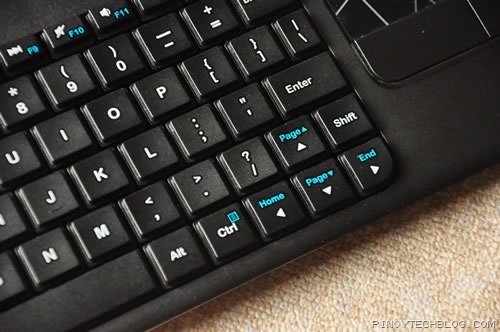 The K400r touch keyboard is similar to the K400 with the compact layout keys and the touchpad with left and right mouseclick and supports multi-touch gestures on the right hand to replace the typical number pad. Since it has a compact layout, expect some keys to have a smaller than your typical size. Like the Enter and right Shift key. The arrow buttons are squeezed in on the lower right corner of the layout making it awkward to get used to. Like the K400, the K400r has a bunch of useful hot keys on top. The dedicated right-click button on the upper left corner allows you to do a right click with your left hand while the right hand is on the touchpad. There’s also buttons for Music, Home, Lock, and Power Off which is quite useful. The difference of the K400r with the K400 is the added button functionalities for Windows 8 actions. 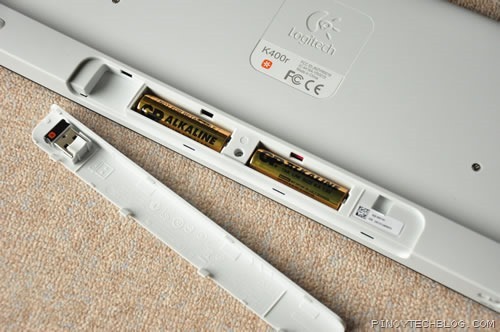 Above some of the F-keys you’ll get some Windows 8 gesture equivalents like Charms for instance. Typing on the Logitech K400r unfortunately, is not that good, especially if you’re used to typing on premium-quality keyboards. You will definitely have that “œplasticky” feeling punching the keys and tactile feedback is uneven across the keyboard. It doesn’t make much sound when typing though. I guess the Logitech K400r should only be your secondary keyboard. What’s nice here is that it’s compact and light that you can use it on you couch to control your Smart TV, or when you typically hook your laptop on the big screen and want to control it from afar. It’s not meant for serious typing unless you want something wireless and portable. 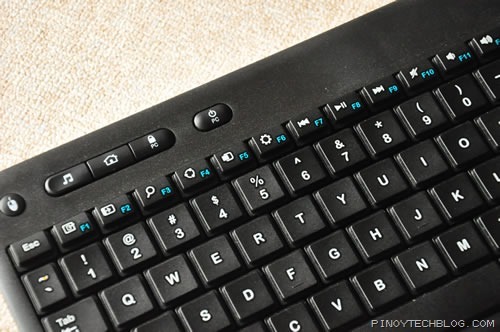 The Logitech K400r retails for Php1,900.